Kahontakwas, Diane Longboat is from the Mohawk Nation, Turtle Clan, a traditional teacher from Six Nations Grand River Territory, Canada. 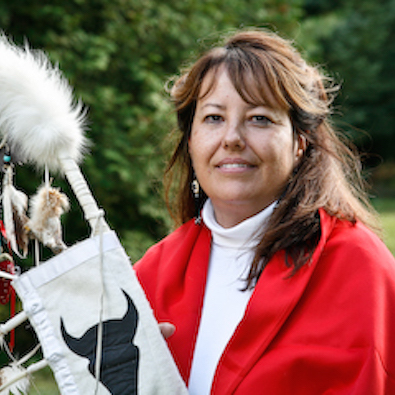 As a ceremonial leader, educator, teacher of Indigenous spiritual ways and healer, Diane is a spiritual activist. Diane is leader of Soul of the Mother, a dedicated team of spiritual leaders and healers who travel among First Nations and globally to carry the Sacred Fire for transformational healing of self, community and the Earth, seeking unity of the human family and building peace. For the past 22 years, Soul of the Mother has been situated on 9 acres of ceremonial lands on the Grand River. There are lodges of healing and purification, fasting and vision quest along with rites of passage. The intent of Soul of the Mother is to create safe, authentic, traditional ceremonies for those seeking a deep connection to the Creator for sacred guidance and personal transformation. She is a professional educator, with a graduate degree in education and has taught and lectured at Universities in Canada and many national and international conferences and gatherings on the topics of spiritual renewal as the guiding force for nation building. From 1976 to 1994, Diane was director of research programs and educational offices both provincially and nationally with First Nations organizations. Her leadership responsibilities at the Sacred Fire of the Thunder (located at Six Nations) include conducting many ceremonies that minister to the needs of her people. She does this not only for Indigenous people, but also those who respectfully seek spiritual direction to guide them on their journey through life. Many dreams, visions and the cherished guidance of Elders have brought Diane to a place of deep spiritual commitment to the service of the Will and Words of the Creator for the rebirth of humanity and the renewal of Mother Earth.